Oh, the Euro is a cruel mistress this summer! And have you seen the price of octopus? A dozen or so years ago, it was always one of the cheapest meze items on any Greek taverna menu. In fact, greedy S used to regard octopus the way a greedy octopus regards small crustaceans; as a cheap and tasty filler until something nicer, like an unsuspecting lobster or perhaps a red mullet or two, wanders along. Now it is one of the most expensive dishes on the menu. What happened? At Pavlos fish taverna, situated on the pebbled fringe of a beautiful green bay on Skopelos island, octopus grilled over charcoal costs more than the pickled fish, the sun-dried fish, the tarama and the smoky aubergine puree put together. Given the exchange rate and the 10e price tag, is it still worth it? You bet. The rosy octopus tentacles are sweetly scorched and crimped with black, while the suckers gleam like cephalic sequins. The texture is just right, too, firm but not chewy, with that unmistakeable clean, marine flavour of something agreeable dragged from the deep. Eating this with a squirt of fresh lemon, a glass of cold wine, a sea view and the beat of thick summer heat all around is one of the great Aegean experiences. And it couldn't quite happen anywhere else, for no one understands octopus like the Greeks do. They totally get its texture and just what to do to get the moisture out to make this unpromising creature as delicious as possible. They catch it, batter it on the rocks to tenderise it, then hang it on washing lines in the sun to dry out and concentrate the flavour. Sometimes they cook it by stewing it in red wine and vinegar but in the summer months, when appetites can be limpid, a scorch on the barbeque and a splash of glassy olive oil is all that is needed. 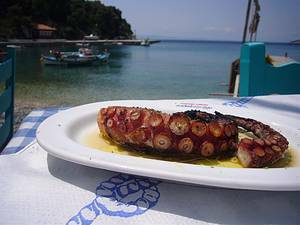 Greeks have been preparing octopus like this for hundreds of years. One of the attractions of coming here is that so little, in terms of customs and dishes, has ever changed. Greek food may not have the spice and flamboyance of its Turkish counterpart or enjoyed the glamorous cachet of Italian dishes or the refined reputation of French cuisine, but it has a rugged integrity that is all its own. 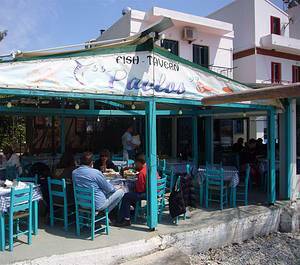 So it is no surprise that there are no surprises on the menu at Pavlos, the longest established of four tavernas that cluster together like shy sisters in the bay of Agnondas. This is the kind of restaurant one dreams about, even though it is not much more than a shack with a large wooden terrace and a roof of tattered canvas. The chairs are painted blue, there are plastic covers on the tables and no booking system to speak of. If there is a table free, you can have it. If there isn't, you can wait in the bar or sunbathe on the beach until there is. Far more civilised, don't you think, than the twice-daily bunfight at the Wolseley or Scott's? The view from the terrace sweeps around a crescent of emerald waves, where maritime pines march down the flanks of the bay right to the water's edge. It is serene and idyllic, with only the harsh tobacco rasp of the fishermen's chat at the next table or the occasional buzz of a passing moped to break the silence. Sleepy-eyed waiters deliver plates of meze and recommend the sardines while a dusty ginger cat patrols hopefully between the tables. Right in front of the restaurant is a small wooden jetty, with a mesh box standing at one end. Inside this box, squares of cleaned squid are pegged out like handkerchiefs, drying and crisping in the salty breeze until a Pavlos customer orders some. Like the octopus, don't expect fish to be cheap here - or anywhere else on the Greek islands for that matter. Over-fishing and the fact that most of the catch is sent to the mainland and beyond pushes prices up. Menus will list favourites such as red mullet (barbouni) and dentex (synagrida) but you should always ask for a recommendation and beware of cheap farmed sea bass, one of Greece's more regrettable contributions to European gastronomy. Still, there are lots of delicious cheap dishes to enjoy. Pavlos lightly pickle their own anchovies and serve them with slices of red onion and red pepper; a refreshing and enjoyable dish. Baby bream are given the squid box treatment, which concentrates the flavour keenly before they are grilled and served with wedges of tomato. The squid itself has strength of flavour and texture quite different from the norm. Plates of fresh, grilled sardines are perfectly done - and lunch edges onwards into the unhurried, sultry afternoon. For pudding there are slices of apples and pears sprinkled with cinnamon, or sticky little strips of candied plum; the latter one of the specialities of the island. Skopelos has an abundance of plum trees, two plum harvests every year and over 100 plum ovens where the fruit is baked into prunes. Tradition has it that the plums have to be massaged and turned on the oven racks seven times and each piece of fruit is squeezed by the farmer, thus bearing his or her thumb print. No wonder that plums and prunes feature on many of the typical dishes from the island, including a wonderful, vinegary stew of tiny baby lamb cooked with prunes, as served at the Ta Kymata Taverna in Skopelos Town. This is another friendly restaurant that takes a quiet pride in serving excellent, well-made food from the best local ingredients. 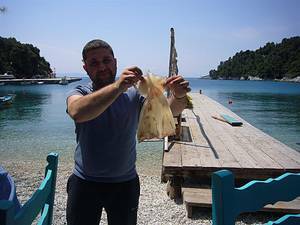 Pavlos Fish Taverna, Agnondas, Skopelos. Tel: 24240 22409. Ta Kymata Taverna, Skopelos Town . Tel: 24240 22381. Dinner nearly everywhere on Skopelos is usually around 20 euros per head, including drinks and service.